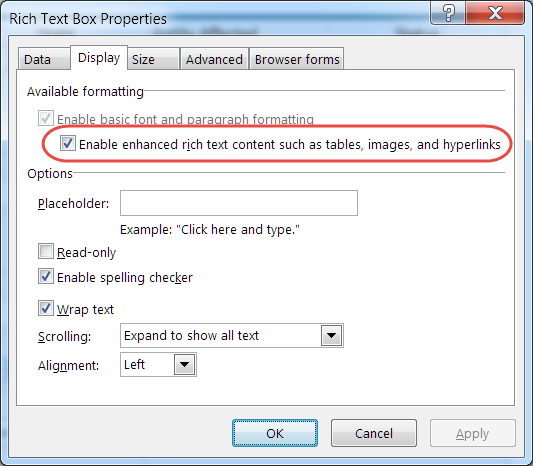 How did I miss “Enable enhanced rich text content such as tables, images, and hyperlinks”? I have a customer testing a new custom list that tracks policy and procedure reviews. The form has been altered using the Customize Form button that opens up InfoPath (yes, I love InfoPath!). Everything has been going well, except for a certain enhanced rich text control on the form. The customer reported that they did not have any way to make a hyperlink in that field. It’s set up in the list to be a multi-line text field that uses rich text (so I can allow for hyperlinks). I have another field that’s set up the same way. On the form, the second field works just fine. You go into the field, highlight a word or phrase, and you get the option to make it a hyperlink in the Ribbon Bar. But that first control… not so much. I checked the list and they were identical in how they’re set up. I checked a list item and there were hyperlinks in both fields. Looks like it works to me. She replied that she must be doing something wrong, as she wasn’t getting the hyperlink option. I went out there in a new item, and guess what… I wasn’t getting the hyperlink option either. It was unselected in my problem control, and that’s why I wasn’t getting the hyperlink options. When I selected that option and republished the form, it worked just like the other control did. Lesson… pay attention to *all* the properties, even the ones you normally overlook.